This tulip, photographed here against the sun appears to be bright scarlet, but in normal reflected light resembles its common name -Black Tulip. (Note that the scarlet flower with yellow inside is considered by botanists to be a distinct species, Tulipa agenensis). The cup or the solitary head, has 6 oval petals with pointed tips, the black basal blotch on each petal being only slightly bordered by yellow; stamens thick and sturdy, with bright yellow polen borne on dark red oblong anthers; stigmas creamy, conspicuous on top of the ovary. Stalk 30 cm high,pale yellow-green. Leaves at bases spreading sideways, about 20 cm long, grey-green with undulating margins; those part-way up the stem smaller, narrower and sharply-pointed. Mostly in cereal fields, hidden below the level of the wheat, but in great numbers; 400-900 ft alt. Flowers March to April. 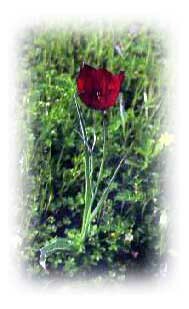 Northern Cyprus only; Tulipa agenensis occurs in Aegean islands, Turkey, Syria, Israel and Iran.